If your current or future home has a private water well, it's a good idea to have your home inspector perform a test on the water coming into your home. The following information will help you to learn more about private water wells. If your family gets drinking water from a private well, it's important to determine if the water is safe to drink. Certain things in the water may pose health risks and it's important to know what health risks could you and your family face? and where can you go to get help or advice. The EPA regulates public water systems; but, it does not have the authority to regulate private drinking water wells. About15% of Americans rely on private drinking water supplies, and unlike public drinking water systems serving many people, experts do not regularly check the water’s source and its quality before it is sent to the tap. Home owners with private water wells must take special precautions to ensure the protection and maintenance of their drinking water supplies. There are three types of private drinking water wells: dug, driven, and drilled. Proper well construction and continued maintenance are keys to the safety of your water supply. Your state water-well contractor licensing agency, local health department, or local water system professional can provide information on well construction. The well should be located so rainwater flows away from it. Rainwater can pick up harmful bacteria and chemicals on the land’s surface. If this water pools near your well, it can seep into it, potentially causing health problems. Water-well drillers and pump-well installers are listed in your local phone directory. The contractor should be bonded and insured. Make certain your ground water contractor is registered or licensed in your state, if required. If your state does not have a licensing/registration program, contact the National Ground Water Association. Many homeowners tend to forget the value of good maintenance until problems reach crisis-levels. That can be expensive. It’s better to maintain your well, find problems early, and correct them to protect your well’s performance. Keep up-to-date records of well installation and repairs, plus pumping and water tests. Such records can help spot changes and possible problems with your water system. If you have problems, ask a local expert to check your well construction and maintenance records. He or she can see if your system is okay or needs work. Protect your own well area. Be careful about storage and disposal of household and lawn-care chemicals and wastes. Good farmers and gardeners minimize the use of fertilizers and pesticides. Take steps to reduce erosion and prevent surface water runoff. Regularly check underground storage tanks that hold home heating oil, diesel, or gasoline. Make sure your well is protected from the wastes of livestock, pets and wildlife. Dug wells are holes in the ground dug by shovel or backhoe. Historically, a dug well was excavated below the ground water table until incoming water exceeded the digger’s bailing rate. The well was then lined (cased) with stones, brick, tile, or other material to prevent collapse. It was covered with a cap of wood, stone or concrete. Since it is so difficult to dig beneath the ground water table, dug wells are not very deep. Typically, they are only 10 to 30 feet deep. Being so shallow, dug wells have the highest risk of becoming contaminated.To minimize the likelihood of contamination, your dug well should have certain features. These features help to prevent contaminants from traveling along the outside of the casing, or through the casing and into the well. The well should be cased with a watertight material (for example, tongue-and-groove pre-cast concrete), and a cement grout or bentonite clay sealant poured along the outside of the casing to the top of the well. The well should be covered by a concrete curb and cap that stands about a foot above the ground. Land activities around a dug well can also contaminate it. While dug wells have been used as a household water supply source for many years, most are relics of older homes, dug before drilling equipment was readily available, or when drilling was considered too expensive. If you have a dug well on your property and are using it for drinking water, check to make sure it is properly covered and sealed. Another problem relating to the shallowness of a dug well is that it may go dry during a drought when the ground water table drops. Like dug wells, driven wells pull water from the water-saturated zone above the bedrock. Driven wells can be deeper than dug wells. They are typically 30 to 50 feet deep and are usually located in areas with thick sand and gravel deposits where the ground water table is within 15 feet of the ground’s surface. In the proper geologic setting, driven wells can be easy and relatively inexpensive to install. Although deeper than dug wells, driven wells are still relatively shallow and have a moderate-to-high risk of contamination from nearby land activities. Assembled lengths of 2- to 3-inch diameter metal pipes are driven into the ground. A screened “well point” located at the end of the pipe helps drive the pipe through the sand and gravel. The screen allows water to enter the well and filters out sediment. The pump for the well is in one of two places: on top of the well, or in the house. An access pit is usually dug around the well down to the frost line, and a water discharge pipe to the house is joined to the well pipe with a fitting. To minimize this risk, the well cover should be a tight-fitting concrete curb and cap with no cracks, and should sit about a foot above the ground. Slope the ground away from the well so that surface water will not pond around the well. If there’s a pit above the well, either to hold the pump or to access the fitting, you may also be able to pour a grout sealant along the outside of the well pipe. Protecting the water quality requires that you maintain proper well construction and monitor your activities around the well. 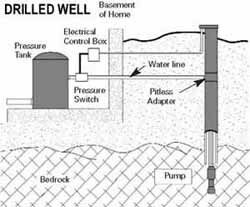 It is also important to follow the same land-use precautions around the driven well as described under dug wells. Drilled wells penetrate about 100 to 400 feet into the bedrock. Where you find bedrock at the surface, it is commonly called ledge. To serve as a water supply, a drilled well must intersect bedrock fractures containing ground water. The casing is usually metal or plastic pipe, 6 inches in diameter, that extends into the bedrock to prevent shallow ground water from entering the well. By law, the casing has to extend at least 18 feet into the ground, with at least 5 feet extending into the bedrock. The casing should also extend a foot or two above the ground’s surface. A sealant, such as cement grout or bentonite clay, should be poured along the outside of the casing to the top of the well. The well should be capped to prevent surface water from entering the well. Most modern drilled wells incorporate a pitless adapter designed to provide a sanitary seal at the point where the discharge water line leaves the well to enter your home. The device attaches directly to the casing below the frost line, and provides a watertight sub-surface connection, protecting the well from frost and contamination. Older drilled wells may lack some of these sanitary features. The well pipe used was often 8, 10 or 12 inches in diameter, and covered with a concrete well cap either at or below the ground’s surface. This outmoded type of construction does not provide the same degree of protection from surface contamination. Also, older wells may not have a pitless adapter to provide a seal at the point of discharge from the well. Hydrofracting is a process that applies water or air under pressure into your well to open up existing fractures near your well, and can even create new ones. Often, this can increase the yield of your well. This process can be applied to new wells with insufficient yield and to improve the quantity of older wells. micro-organisms: Bacteria, viruses, parasites and other microorganisms are sometimes found in water. Shallow wells — those with water close to ground level — are at most risk. Runoff, or water flowing over the land surface, may pick up these pollutants from wildlife and soils. This is often the case after flooding. Some of these organisms can cause a variety of illnesses. Symptoms include nausea and diarrhea. These can occur shortly after drinking contaminated water. The effects could be short-term yet severe (similar to food poisoning), or might recur frequently or develop slowly over a long time. radionuclides: Radionuclides are radioactive elements, such as uranium and radium. They may be present in underlying rock and ground water. radon: Radon isa gas that is a natural product of the breakdown of uranium in the soil and can also pose a threat. Radon is most dangerous when inhaled, and contributes to lung cancer. Although soil is the primary source, using household water containing radon contributes to elevated indoor radon levels. Radon is less dangerous when consumed in water, but remains a risk to health. Septic tanks are designed to have a leach field around them, which is an area where wastewater flows out of the tank. This wastewater can also move into the ground water. bacteria and nitrates: These pollutants are found in human and animal wastes. Septic tanks can cause bacterial and nitrate pollution. So can large numbers of farm animals. Both septic systems and animal manure must be carefully managed to prevent pollution. Sanitary landfills and garbage dumps are also sources. Children and some adults are at higher risk when exposed to waterborne bacteria. These include the elderly and people whose immune systems are weak due to AIDS or treatments for cancer. Fertilizers can add to nitrate problems. Nitrates cause a health threat in very young infants called “blue baby syndrome." This condition disrupts oxygen flow in the blood. concentrated animal feeding operations (CAFOs): The number of CAFOs, often called “factory farms,” is growing. On these farms, thousands of animals are raised in a small space. The large amounts of animal waste/manure from these farms can threaten water supplies. Strict and careful manure management is needed to prevent pathogen and nutrient problems. Salts from high levels of manure can also pollute ground water. fertilizers and pesticides: Farmers use fertilizers and pesticides to promote growth and reduce insect damage. These products are also used on golf courses and suburban lawns and gardens. The chemicals in these products may end up in ground water. Such pollution depends on the types and amounts of chemicals used and how they are applied. Local environmental conditions (soil types, seasonal snow and rainfall) also affect this pollution. Many fertilizers contain forms of nitrogen that can break down into harmful nitrates. This could add to other sources of nitrates mentioned above. Some underground agricultural drainage systems collect fertilizers and pesticides. This polluted water can pose problems to ground water and local streams and rivers. In addition, chemicals used to treat buildings and homes for termites and other pests may also pose a threat. Again, the possibility of problems depends on the amount and kind of chemicals. The types of soil and the amount of water moving through the soil also play a role. local businesses: These include nearby factories, industrial plants, and even small businesses such as gas stations and dry cleaners. All handle a variety of hazardous chemicals that need careful management. Spills and improper disposal of these chemicals and other industrial wastes can threaten ground water supplies. leaking underground tanks and piping: Petroleum products, chemicals and waste stored in underground storage tanks and pipes may end up in the ground water. Tanks and piping leak if they are constructed or installed improperly. Steel tanks and piping corrode with age. Tanks are often found on farms. The possibility of leaking tanks is great on old, abandoned farm sites. Farm tanks are exempt from the EPA rules for petroleum and chemical tanks. household waste: Improper disposal of many common products can pollute ground water. These include cleaning solvents, used motor oil, paints, and paint thinners. Even soaps and detergents can harm drinking water. These are often a problem from faulty septic tanks and septic leaching fields. lead and copper: Household plumbing materials are the most common source of lead and copper found in home drinking water. Corrosive water may cause metals in pipes or soldered joints to leach into your tap water. Your water’s acidity or alkalinity (often measured as pH) greatly affects corrosion. Temperature and mineral content also affect how corrosive it is. They are often used in pipes, solder and plumbing fixtures. Lead can cause serious damage to the brain, kidneys, nervous system, and red blood cells. The age of plumbing materials — in particular, copper pipes soldered with lead — is also important. Even in relatively low amounts, these metals can be harmful. The EPA rules under the Safe Drinking Water Act limit lead in drinking water to 15 parts per billion. Since 1988, the Act allows only lead-free pipe, solder and flux in drinking water systems. The law covers both new installations and repairs of plumbing. Have your water tested periodically. It is recommended that water be tested every year for total coliform bacteria, nitrates, total dissolved solids, and pH levels. If you suspect other contaminants, test for those. Always use a state-certified laboratory that conducts drinking water tests. Since these can be expensive, spend some time identifying potential problems. Consult your InterNACHI inspector for information about how to go about water testing. you replace or repair any part of your well system. Identify potential problems as the first step to safe-guarding your drinking water. The best way to start is to consult a local expert -- someone who knows your area, such as the local health department, agricultural extension agent, a nearby public water system, or a geologist at a local university. Check the paper or call your local planning and zoning commission for announcements about hearings or zoning appeals on development or industrial projects that could possibly affect your water. Attend these hearings, ask questions about how your water source is being protected, and don't be satisfied with general answers. Ask questions, such as: "If you build this landfill, what will you do to ensure that my water will be protected?" See how quickly they answer and provide specifics about what plans have been made to specifically address that issue. Is your well downstream from your own or a neighbor's septic system? Do you or your neighbors dispose of household waste or used motor oil in the backyard, even in small amounts? If any of these items apply, it may be best to have your water tested and talk to your local public health department or agricultural extension agent to find ways to change some of the practices which can affect your private well. In addition to the immediate area around your well, you should be aware of other possible sources of contamination that may already be part of your community or may be moving into your area. Attend any local planning or appeals hearings to find out more about the construction of facilities that may pollute your drinking water. Ask to see the environmental impact statement on the project. See if the issue of underground drinking water sources has been addressed. If not, ask why.